Carb Killa Shake is a convenient way to consume additional protein between meals without unwanted calories or carbs. This thick and creamy shake is as technologically advanced as the bars and can be consumed throughout the day. Informed Sport Registered. 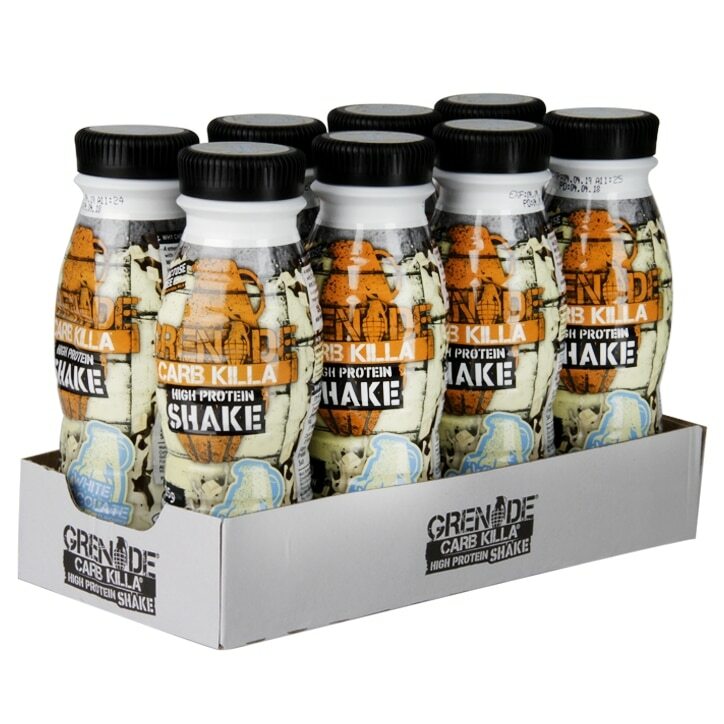 Grenade Carb Killa Shake can be consumed at any time during the day and is best served chilled. Shake well and enjoy as a part of a balanced diet and a healthy lifestyle. Water, Skimmed Milk, Protein Blend (Calcium Caseinate (Milk), Whey Protein Concentrate (Milk)), Cream (Milk), Modified Starch, Stabilizers: Gellan Gum, Carrageenan; Sweeteners: Acesulfame Potassium, Sucralose; Flavouring, Salt, Enzyme: Lactase. Unopened, store at room temperature, once opened store chilled and consume within 12 hours. For best before see neck of bottle. UHT Treated. Grenade Carb Killa Shake White Chocolate is rated 4.8 out of 5 by 9. Rated 5 out of 5 by Sha22 from This tastes AMAZING I tried this randomly one day and then I immediately bought 24 more! It tastes exactly like Milkybar mousse and if you've been on the atkins diet for six months plus like I have been, these shakes are amazing!!! Rated 5 out of 5 by Hogbos from Very Tasty Protein shakes can be very hit and miss for taste, but the flavour and taste of this shake and all the others in the Grenade range are excellent. You won’t be disappointed.